Good Morning. Hard to believe today it has been exactly 6 months I have hosted this linkup. You have seen a lot of Little White Dresses on me this Summer. Well, here is one more. 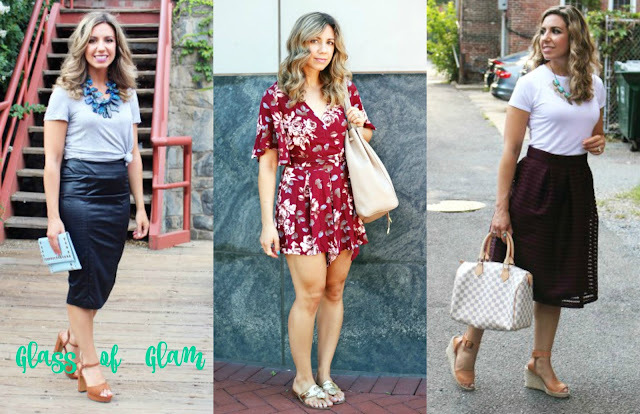 I am co-hosting today with the Lovely and Stylish ROXANNE from Glass of Glam whose blog is very nice and I love the name. This attorney has amazing style and amazing cocktail and drink recipes in her blog. She has been the Featured Blogger on Thursday Moda before, as well as part of my Thursday Moda Favorites not too long ago. 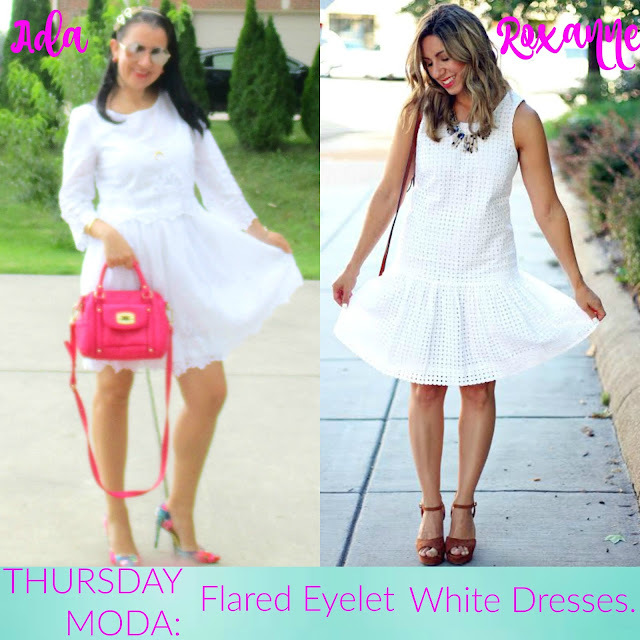 We styled Pretty, Feminine, Flared Eyelet White Dresses today. We both dressed them up and we both chose Crossbody Bags and Pretty Necklaces. This never-worn before LWD got worn to work recently with my Teal+Hot Pink D'Orsay Pumps by Target. I have them in the Bright Coral Suede and the Leopard version too - love them. Picking up the pink from the pumps, I added my Hot Pink Crossbody which is a bag perfect for work because is big enough and even fits my Samsung Galaxy Pad. As you can tell, this Dress has beautifully-patterned floral eyelet detail by the hem of the skirt and by the hem of the top which sits as an overlay. Since it has 3/4 sleeves and it is fully lined, it would be perfect to transition into Fall. I can picture it with both a colorful long cardigan and a black moto jacket. My latest set of Rocksbox included the Gorgeous Horse-Shoe Pendant Necklace I am wearing and the Adjustable Aqua Stone Cuff. I decided to wear Gold Rings too to match those. Being away from work for almost three weeks I had to come back with a bang style-wise. First with my Navy Dress which I wore on Monday and next with this White Dress which I wore Tuesday. I got lots of compliments on both. Knee-Length, Fit+Flare Eyelet LWD w/ Crochet detail: Sami+Dani (New) (similar, Steal, love this), (similar, on Sale), (similar, Splurge, my Favorite). Gold, Aviator Sunglasses w/ Floral design off the sides: Aeropostale (New) (similar, huge Steal), (similar, Great Deal), (similar, Splurge). Burnt Orange, Plastic Double-Sided, 360 Studs: An Accessories Boutique in Albania (very similar, Steal), (similar in classic white pearls, Great Deal), (identical in gold metallic). Crescent, Gold-tone, Long Pendant Necklace: Gorjana via Rocksbox (New) (identical), (very similar, huge Steal), (similar, Steal, love this). Octavia, Gold-tone Cuff in Aqua Opal: Loren Hope via Rocksbox (New) (same in iridescent stones, love this), (similar, Steal), (similar, Splurge). 3-in-1 Dainty Gold-tone Rings w/ Multi Colored Mini Circle Stones: Ann Taylor (New) (similar in silver), (similar in silver stones+pearls, small Splurge, love this). Burgundy-Red, Satin Lipstick: Beautifully Bare Satin Lipstick by E.L.F. in "Touch of Berry" (same in pink), (similar, Steal, love this), (similar, Great Deal, my Favorite). Canvas, Blue+Hot Pink Floral D'Orsay Pumps: Merona via Target (New) (similar, Steal, my Favorite), (similar, Great Deal), (similar, love these). Today's featured bloggers don't have much in common, except two of the dresses are in navy and two of the dresses are in a slip-dress style. Thanks to all 120 of you who linked up last week and continue to make my linkup, a success! 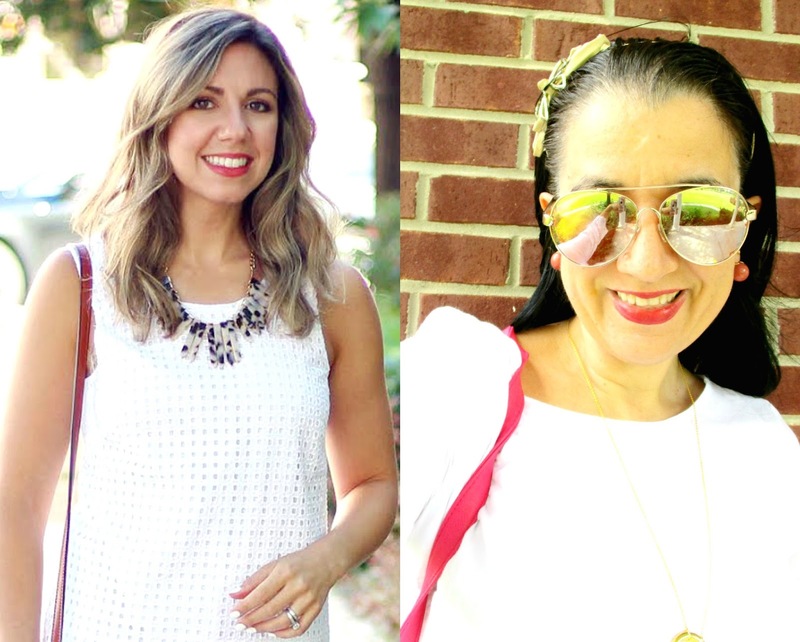 Today's Featured Blogger is JENNIE from A Pocketful of Polka Dots who loves polka dots, obviously. 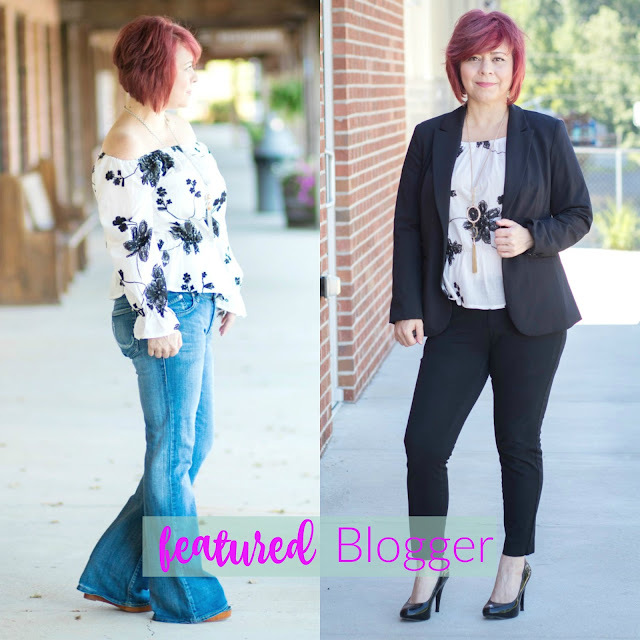 She linked up a Feminine White+Black Floral OTS Top which she styled two ways: more casually with blue denim flares and cognac wedges, and dressed up for work under a Classic Black Suit. I almost featured her last week too because she linked up the most beautiful yellow dress. Jennie has been blogging for over two years and I have pretty much followed her from the beginning. She always dresses to impress especially in polka dots, plaid and leopard. 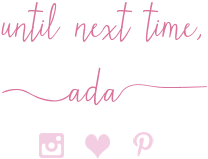 Also, on Fridays she runs her own Style Linkup so make sure to click on her blog and join her tomorrow, as well. Priincess' Look is actually from the previous week's linkup (2 weeks ago) but I loved it so much and had to share it. Her 'Off the Shoulder Bodysuit' looks splendid with the burgundy wrap tulip skirt. Logan celebrated her 'Twenty Eight' looking stunning while pregnant, in a Lace Long-Sleeve Navy Dress and Rust Crossbody Bag. 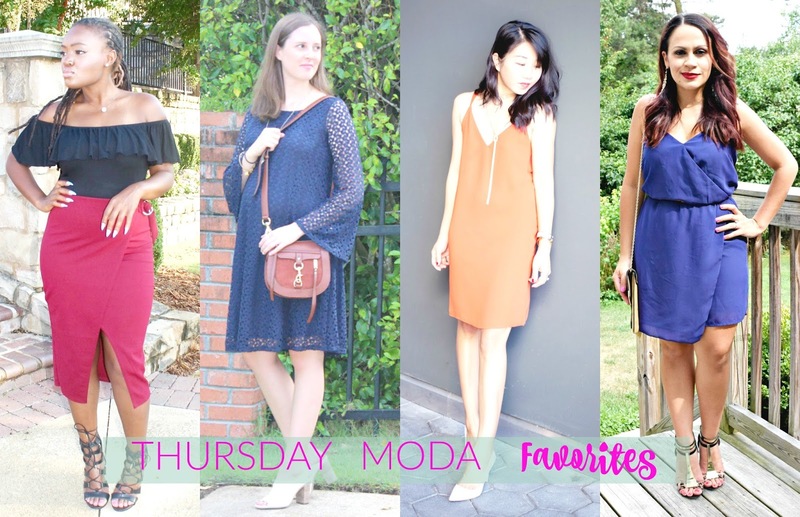 Sheree in 'Red' is never a stranger to Thursday Moda Favorites. Her orange-red slip dress (worn for her birthday) is super simple yet amazing. Love it with the white pumps. Melissa, also in a slip dress, paired her navy one with 'Cheetah Print' and gold. Love the accessories. Today's Thursday Moda Co-Host: Glass of Glam (by Roxanne). These are some recent looks of her from this Summer which I loved. Her collection of Statement Necklaces is stunning.